The 1.4GHz quad-core CPU that powers the Asus Transformer Prime sure sounds promising, but the real question is how much of a performance boost it brings. And, as it turns out, the answer is a lot. About two times, to be specific. As it turns out, the Tegra 3 chipset isn’t all talk and no action – that thing is blazing fast. 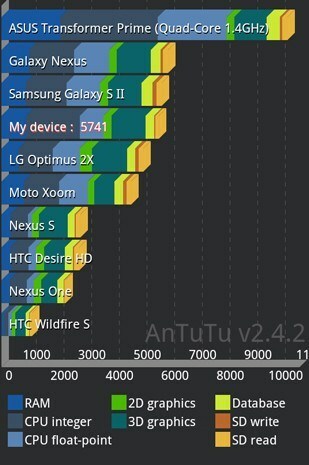 The Transformer Prime score appeared in the results browser of the AnTuTu benchmark and it’s more than twice higher than that of the Tegra 2-powered Motorola Xoom. Even the Ice Cream Sandwich-running Galaxy Nexus barely achieves 60% of the Transformer Prime score. And you shouldn’t forget that the Samsung smartphone needs to handle lower resolution than the Asus tablet (even if the difference is tiny). Do you need any further convening or are you already heading to the store to save your place in line for the November 9 launch?